A month ago, the Middle East plunged into a diplomatic crisis in which the Saudi-led coalition including nine sovereign governments cut diplomatic ties with Qatar. The coalition accused Qatar of fueling regional terrorism, citing this as the source of the major diplomatic rift. 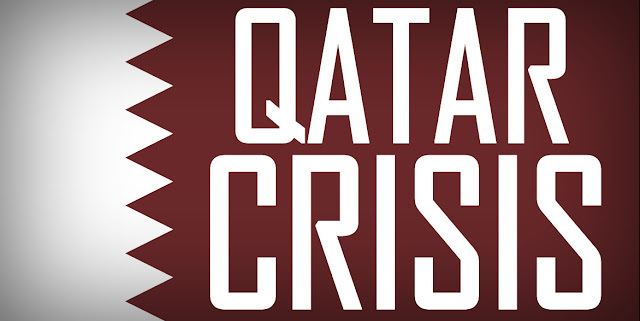 Expanding the primary reasons, this current crisis are rooted mainly in Doha’s support for Sunni Islamist movements across GCC; the emirate’s ownership of al-Jazeera and other media platforms which numerous Arab governments perceive as propaganda networks seeking to stir up unrest; and Qatar’s cordial relationship with the Islamic Republic of Iran, with which the Arab Gulf country shares the world’s largest natural gas reserve. Bahrain, Egypt, and UAE along with Saudi Arabia believe that Doha’s actions have fueled extremism and terrorism across the Arab world. However, Doha denies the charges and claims the blockade is an effort to undermine its autonomy and impede freedom of speech. Since, there are no signs the standoff will spiral into the military confrontation, the crisis has bolstered nationalist support for the monarchy. Sever all ties to “terrorist organizations”, specifically the Muslim Brotherhood, Islamic State, al-Qaida and Lebanon’s Hezbollah. Formally declare those entities as terrorist groups. Hand over “terrorist figures” and wanted individuals from Saudi Arabia, the UAE, Egypt, and Bahrain to their countries of origin. Freeze their assets, and provide any desired information about their residency, movements, and finances. End interference in sovereign countries’ internal affairs. Stop granting citizenship to wanted nationals from Saudi Arabia, the UAE, Egypt, and Bahrain. Revoke Qatari citizenship for existing nationals where such citizenship violates those countries’ laws. Stop all contacts with the political opposition in Saudi Arabia, the UAE, Egypt, and Bahrain. Hand over all files detailing Qatar’s prior contacts with and support for those opposition groups. The deadline expired on July 3, 2017, which was later further extended by 48 hours. The joint statement was released through SPA the official news agency of Saudi Arabia while KUNA the Kuwait’s official news agency claimed that Emir received a response from Qatar regarding 13 point demands presented by a Saudi-led block of Arab countries. Details of the response have not been revealed to the media, yet. United States policy towards Qatar so far has been marked by confusion. On June 9, 2017, the U.S. President stood in the Rose Garden at the White House and called out Qatar saying the tiny Gulf state had “historically been a funder of terrorism at a very high level”. But in contrast, the State Department under Rex Tillerson has twice upbraided Saudi Arabia’s approach to Qatar and questioned its true motives in sparking the diplomatic crisis. In a recent article, Dubai-based analyst Justin McCauley ascertains that the U.S. response to the Qatar crisis ignores the strategic necessity of maintaining unity in the GCC (especially if seeking to counter Iran). But researchers in the United States, have an altogether a different view towards the region. Shortly after the embargo put on Qatar, Turkey condemned the blockade, and immediately sent food stocks, and simultaneously fast-tracked legislation through its parliament to deploy troops on Qatari territory. On June 7, 2017, Turkey's parliament ratified two bills; one allowing the deployment of Turkish troops in Qatar and another approving an accord between the two countries on military training cooperation. On July 5, 2017, Turkey's President Tayyip Erdogan reaffirmed his country's support for Qatar in the current crisis with Saudi-led coalition saying their demands against the tiny Gulf nation were unacceptable. The country has sent 100 cargo planes with supplies since its neighbors cut air and sea links. It has also rushed through legislation to send more troops to the military base in Doha. Two contingents of Turkish troops with columns of armored vehicles have arrived since the crisis erupted on June 5, 2017. Right after the crisis erupted, Trump tweeted that it was "good to see the Saudi Arabia visit with the king and 50 countries already paying off" - the perception in Tehran that the regional rift was largely influenced by the current American administration. Instead of giving a knee-jerk reaction and rather than taking a side with Qatar openly, Iranian government immediately insisted on the necessity for dialogue and engagement to prevent an unwanted escalation. An Iranian destroyer and two Chinese destroyers conducted a naval exercise on June 18, 2017, which took place in the eastern portion of the Strait of Hormuz and the Sea of Oman, according to IRNA. Some 700 Iranian Navy personnel participated in the drill. Iran is also planning to establish a direct marine route through its Valfajr Shipping Company from the Persian Gulf port of Bushehr to Qatar in the coming two weeks. By the second week in crisis, Iran has already started shipping more than 1,000 tons of fruits and vegetables to Qatar every day, Fars reported. On June 7, 2017, French government spokesman Christophe Castaner told reporters in a weekly briefing. - "Qatar must be completely transparent and answer precisely the questions that have been asked notably by its neighbors. That's what France is asking for,". After Qatar’s Foreign Minister Sheikh Mohammed bin Abdulrahman Al Thani traveled to Germany to meet with him on June 9, 2017, German Foreign Minister Gabriel Sigmar called for “solutions, especially lifting the sea and air blockades.” The Foreign Minister’s defense of Qatar during the ongoing Gulf Cooperation Council (GCC) diplomatic crisis speaks volumes about the European country’s relations with the Arab Gulf emirate, a rapport long ignored by foreign policy analysts. On June 17, 2017, A statement released by the Directorate of Moral Guidance of the Qatari Ministry of Defence - "Qatari Emiri Naval Forces and French Naval Forces held military training exercises in Qatar's northern territorial waters." On June 19, 2017, The European Union issued its first collective statement and called on Gulf countries to "de-escalate the tensions and to engage in direct dialogue". On June 26, 2017, German Foreign Minister Sigmar Gabriel quoted - 13 demands submitted by four Arab states to Qatar are "very provocative" because some items directly challenge Doha's sovereignty. On the other hand, China has always consciously refrained from following the path of the diplomatically and militarily engaged and overstretched Western powers. According to Philip Gater-Smith, U.K.-based Gulf analyst who focuses on China’s economic relations with the GCC and Iran - "Till today, it's “free-riding” on the American security umbrella in the Gulf has directly benefited China’s OBOR plans by saving the Chinese large amounts of money and possibly blood, and by ensuring friendly diplomatic relations and lucrative economic ties with all regional countries." India is treading very cautiously in Gulf waters in this time of crisis. The impact of any conflict in the Gulf cannot be over-estimated, given India’s dependence on oil supplies and remittances from some eight million Indians based there. For New Delhi to continue to be as sanguine about the Qatar crisis as it appeared to be a few weeks ago when External Affairs Minister Sushma Swaraj called it an “internal matter” of the GCC, is no longer an option. Despite the embargo, Qatar has proved more resilient than the Saudi-led coalition and it appears to have anticipated the rift beforehand by maneuvering with exceptional agility. The country quickly shifted its international arrangements and attracted the prominent support from Iran and Turkey. Same has been witnessed, a decade ago when Saudi Arabia in 2003 asked US forces to leave the country due to domestic anti-American pressure in the wake of 9/11, Qatar successfully proposed that the US make a new home in their own country. In 2014, Saudi Arabia, the UAE, and Bahrain pulled a much milder version of the move that we’re witnessing today, withdrawing their ambassadors from Qatar over its support for the Muslim Brotherhood, among other wrongs. That time, Qatar made some concessions, including curbing some of its ties to the group and cooperating more closely with Gulf states on security, and diplomatic ties were restored. Post-Arab Spring uprisings, Saudi Arabia and Iran are fighting with each other at the multiple proxy fronts in the middle east, a kind of regional political struggle for dominance that openly projecting sectarian characteristics. Syria happens to be a ground zero for this conflict. But, in 2011 Riyadh has intervened in Bahrain to stop a Shia-led uprising that it feared would increase Iranian influence in Arabian peninsula, and in Yemen, where the Saudi-led coalition is already at war with Iranian-linked Houthi rebels. Iran is considered as an ascendant power in the beleaguered Arab world. This is particularly true as we see Russia bolstering its efforts to further patronize Tehran. Moreover, given Iran’s 30 years of success in asymmetric warfare (and its stalemate with Iraq in the longest conventional war of the twentieth century), it is highly questionable whether Saudi Arabia, with no real-world combat experience to speak of other than its failing performance in Yemen, can compete with Tehran when it comes to warfare, conventional or, more importantly, unconventional. Saudi Arabia desperately wants to contain Qatar and wants to keep the Arabian peninsula just for the Arabs by keeping Iranians and Turkish away. Whereas, Qatar wants to break Saudi Arabia’s regional hegemony subtly and to protects its independent foreign policy and pursue it beyond GCC's orbit by nurturing a close relationship with Iran, with which it shares the North Dome gas field. The field is largely responsible for the high standards of living in Qatar, which has a native population of less than 300,000, compared with Iran’s 80 million. There is absolute "No doubt'' within the diplomatic circles about the current crisis which seems to be encouraging a closer alliance between Qatar and Iran along with Turkey, increasing Iran’s leverage in the Persian Gulf. Saudi Arabia and its allies expected Qatar to cave in quickly to their 13-point ultimatum, but it seems it will be not that easy to bring down a country (no matter how tiny it seems to be) to its knee which has a sovereign wealth funds of 250 per cent of its own gross domestic product, Central Bank reserves and an undisclosed strategic reserve with the ministry of finance, making it one of the world’s wealthiest nations in per capita terms. What next is purely wait-and-watch policy for the moment, for most of them, and for most of us.